[S58] 1921 Census of Canada, Ancestry.com, (Name: Ancestry.com Operations Inc; Location: Provo, UT, USA; Date: 2013;), Reference Number: RG 31; Folder Number: 109; Census Place: Longueuil (Town), Chambly-Verchères, Quebec; Page Number: 8. [S33] 1930 United States Federal Census, Ancestry.com, (Name: Online publication - Provo, UT, USA: Ancestry.com Operations Inc, 2002.Original data - United States of America, Bureau of the Census. Fifteenth Census of the United States, 1930. Washington, D.C.: National Archives and Records Administration, 1930. T626, ;), Year: 1930; Census Place: Bronx, Bronx, New York; Roll: 1463; Page: 13A; Enumeration District: 0004; Image: 133.0; FHL microfilm: 2341198. 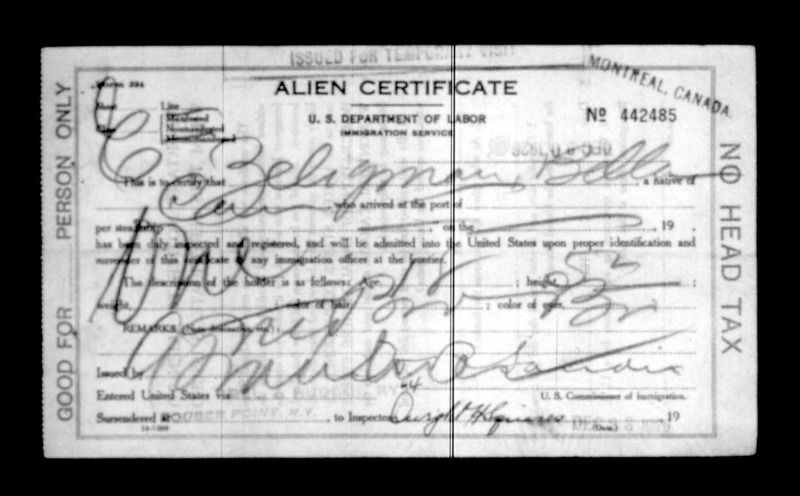 [S555] U.S., Records of Aliens Pre-Examined in Canada, 1904-1954, Ancestry.com, (Name: Ancestry.com Operations, Inc.; Location: Provo, UT, USA; Date: 2012;), The National Archives at Washington, D.C.; Washington, D.C.; Head Tax Certificates (Form 524, Nonexempt Aliens) Surrendered upon Admission to the United States; National Archives Microfilm Publication: A4086; NAI Number: 3000094; Record Group Title: Record. [S277] Border Crossings: From Canada to U.S., 1895-1956, Ancestry.com, (Name: Ancestry.com Operations, Inc.; Location: Provo, UT, USA; Date: 2010;), The National Archives at Washington, D.C.; Washington, D.C.; Manifests of Passengers Arriving at St. Albans, VT, District through Canadian Pacific and Atlantic Ports, 1895-1954; Record Group Title: Records of the Immigration and Naturalization Service, 178. [S163] Hamburger Passagierlisten, 1850-1934, Staatsarchiv Hamburg, (Name: Online publication - Provo, UT, USA: Ancestry.com Operations Inc, 2008.Original data - Staatsarchiv Hamburg, Bestand: 373-7 I, VIII (Auswanderungsamt I). Mikrofilmrollen K 1701 - K 2008, S 17363 - S 17383, 13116 - 13183.Original data: Staatsarchiv Hamburg,;), Staatsarchiv Hamburg; Hamburg, Deutschland; Hamburger Passagierlisten; Microfilm No. : K_1788. [S290] Canadian Passenger Lists, 1865-1935, Ancestry.com, (Name: Ancestry.com Operations Inc; Location: Provo, UT, USA; Date: 2010;). [S560] Quebec, Canada, Notarial Records, 1626-1935, Ancestry.com, (Name: Ancestry.com Operations, Inc.; Location: Lehi, UT, USA; Date: 2016;), Bibliothèque et Archives nationales du Québec; Montréal, Quebec, Canada; Collection: Archives des notaires du Québec; District: Montréal; Title: Théoret, Napoléon (1884-1922). [S99] New York Passenger Lists, 1820-1957, Ancestry.com, (Name: Online publication - Provo, UT, USA: Ancestry.com Operations, Inc., 2010.Original data - Passenger Lists of Vessels Arriving at New York, New York, 1820-1897; (National Archives Microfilm Publication M237, 675 rolls); Records of the U.S. Customs Service, R;), Year: 1906; Arrival: New York, New York; Microfilm Serial: T715, 1897-1957; Microfilm Roll: Roll 0744; Line: 11; Page Number: 35.